Beijing’s growing collaboration with India’s neighbours has created a sense of unease in New Delhi. China’s emergence as a regional strategic and economic actor has reshaped the prospects for connectivity in Asia. 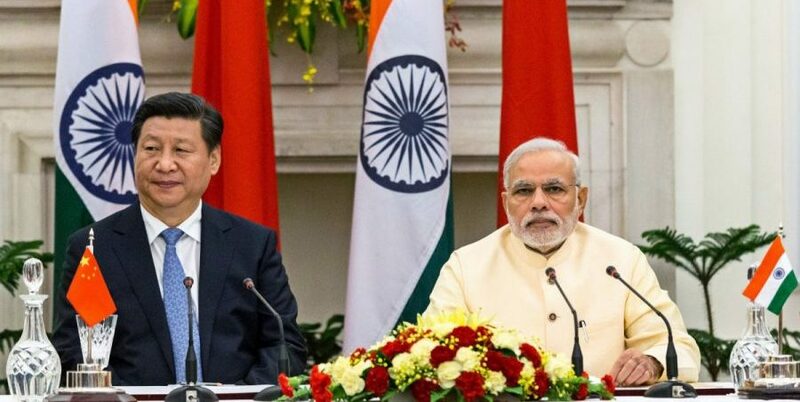 Beijing has demonstrated a newfound sense of political will to undertake regional connectivity initiatives, supported by the country’s surplus capital, a shift that has changed the security environment in India’s neighbourhood. Naturally, as China’s influence in South Asia grows, India is faced with the challenge of managing its relationship with its biggest neighbour and competing to maintain its prominence in the region. India has begun to view China’s commercial initiatives as a means to advance its strategic ambitions in ways that often are not conducive to India’s interests. 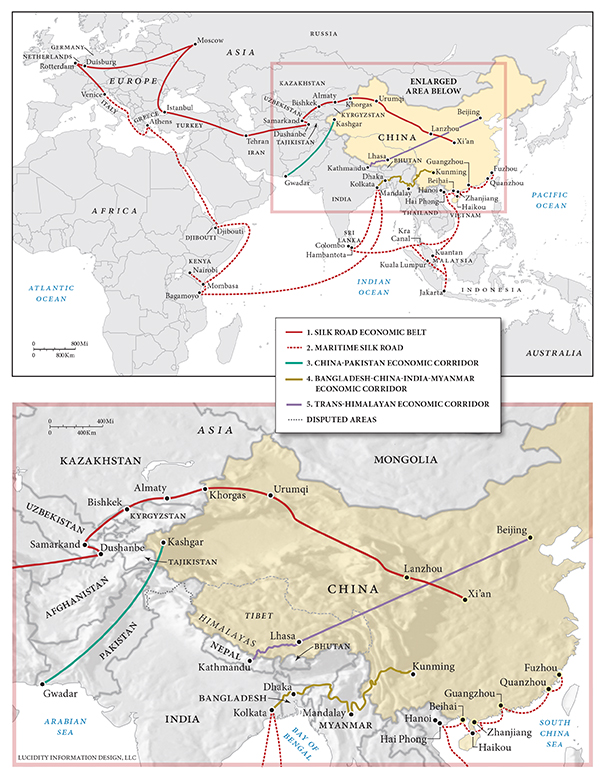 The view that connectivity offers a set of tools to influence other countries’ foreign policy choices has become commonplace in analysis about the China-led Belt and Road Initiative (BRI). The BRI has garnered much attention, positive and negative, since its inception in 2013. It is one of the world’s biggest initiatives for promoting connectivity and providing funds to finance infrastructure development. In South Asia, the BRI underscores the growing Sino-Indian competition in the subcontinent and the Indian Ocean region. To best understand India’s concerns, it is helpful to examine four specific corridors that constitute major components of the BRI and run through India’s South Asian neighbourhood: the CPEC, the BCIM Economic Corridor, the Trans-Himalayan Economic Corridor, and the MSR. These four corridors and the infrastructure projects associated with them have a direct bearing on India’s strategic interests. They run close to India’s continental and maritime borders and are affecting its security interests and strategic environment. China’s engagement with India’s immediate neighbours through these corridors threatens to alter existing power dynamics in the region. India is not opposed to infrastructure development in the region, but it is concerned about the strategic implications of certain Chinese-led initiatives. A primary concern for New Delhi is that Beijing will use its economic presence in the region to advance its strategic interests. One notable example is the strategically located port of Hambantota, which the Sri Lankan government was forced to lease to China for ninety-nine years in 2017. The port was built using Chinese loans but, due to the high interest rates, Sri Lanka was unable to repay and incurred a burgeoning debt burden. India will have to work with its partners in the region to offer alternative connectivity arrangements to its neighbours. To date, New Delhi has been slow in identifying, initiating, and implementing a coherent approach to connectivity in the region. Given the geopolitical stakes and India’s reservations about how China’s BRI connectivity projects are currently being pursued and the strategic advantages they may confer, there is likely little scope for the two countries to collaborate on the BRI. India perceives efforts to enhance interconnectedness as a new theatre for geopolitical competition with China in South Asia and the Indian Ocean. At the same time, connectivity also presents India with an opportunity to reestablish its regional primacy. Ultimately, India must be more proactive. While China is successfully implementing development projects hundreds of miles from its borders, India is still struggling to craft domestic development plans for its own border regions. New Delhi intends to prioritise development in its international engagement, but India will have to weave together its ad-hoc initiatives into one coherent road map to regional connectivity and infrastructure construction. Even as India must address infrastructure and development needs at home, it also needs to provide an alternative to China’s overtures to the region. To this end, India must not only respond to the changes Chinese engagement is prompting in its neighbourhood but also collaborate with partners to further its vision of regional connectivity, while accounting for its own capacity and resource limitations. Until the advent of the BRI, New Delhi did not feel its bilateral relationships with its neighbours were threatened as there was no such competition between India and leading donors in South Asia, like Japan. China’s rise not only introduces a new actor in South Asian dynamics but also highlights the underlying fact that Beijing’s influence in the region comes at a cost to India’s role and profile as a regional leader. China’s engagements in South Asia are a result of its global ambitions to be a great power. India currently lacks the resources to compete with China in terms of global power ambitions, and this shift undoubtedly affects New Delhi’s strategic and national interests. In some cases, India can take steps on its own to sharpen its response. To begin with, India will have to clearly account for its resources and capabilities related to connectivity and infrastructure development. The current government understands the urgency of acting boldly to address the changes in its neighbourhood, efforts that will require fresh thinking and new approaches, such as the concept of burden sharing. New Delhi must invest in and develop its strategic assets—like the Andaman and Nicobar Islands, for instance—to project power across the Indian Ocean. These unilateral steps notwithstanding, India’s ongoing response might not be enough to provide neighbours with a feasible alternative to Beijing’s continental and maritime projects, in light of New Delhi’s significant resource limitations. Given India’s massive mandate to develop much-needed infrastructure domestically, the country’s ability to act alone in South Asia and the larger Indian Ocean is further limited. New Delhi cannot and need not act alone. New Delhi must seek help from partners like Japan when necessary to build and upgrade its infrastructure and create an alternative to Chinese-led connectivity corridors and infrastructure projects. India must have a blueprint to identify specific projects, mechanisms, and goals for its connectivity initiatives. Other countries like Australia, France, Germany, the UK, and the United States are keen to see India play a leading role in the region. These nations have technical expertise and are already present in the region to some degree. New Delhi must identify the advantages each of these states offer and leverage them to collaborate in areas of common interest and pursue its strategic connectivity goals. While India seems to have identified partnerships as a way to address its connectivity challenges, it must now be deliberate about the nature and scope of relevant projects in the region. So far, New Delhi’s response has been reactive and inadequate. If India continues to pursue a reactive policy, it will exhaust its limited resources chasing China as Beijing strives to become a regional and global power. As the BRI and other connectivity projects transcend and reimagine boundaries and connect Asia with far-flung locations around the world, policymakers have to grapple with new ideas and challenges. Competition and other diplomatic interactions between China and India bilaterally, in their neighbourhood, and on a global scale will shape Asia’s new security architecture and determine the region’s economic and strategic terrain for many years to come. This article is an edited extract of the article titled “India’s Answer to the Belt and Road: A Road Map for South Asia” that appeared on the Carnegie India website.